The 9th of May was the day of Graduation from the Society of Botanical Artists DLDC Diploma course, Course 9. 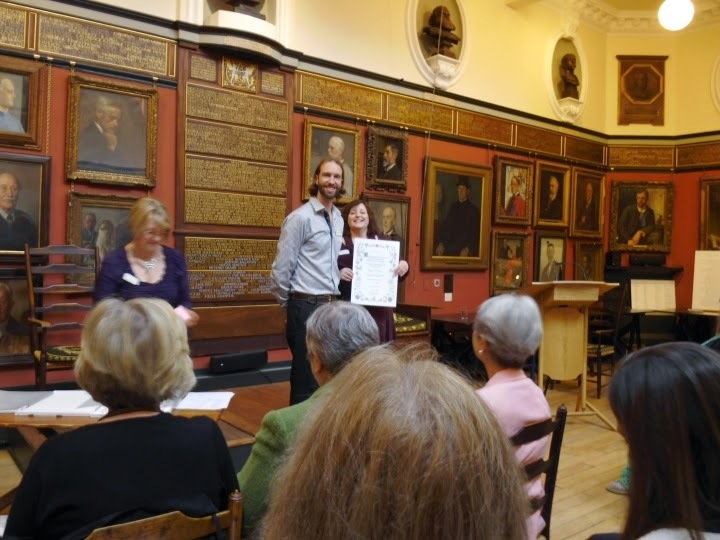 The ceremony was held at the Art Worker's Guild in Bloomsbury, London - A beautiful old building, and a lovely setting for a gathering of Botanical Artists. After a long day at the SBA Exhibition, Westminster Central Hall, London, manning the Student Desk and talking to prospective students, it was time for a mad dash through London in a taxi. I even got to say "Follow that Cab" ! Simon Williams, the new Course Director, Master of Ceremonies, did a grand job and kept things fairly informal. An international occasion, students had travelled from as far afield as Australia, Canada, Italy and America to name just a few. Sadly some students were unable to travel to the ceremony, but their names were read out and we celebrated their achievements too. Refreshments were served and we had the chance to catch up, make new friends and chat to the tutors. So there we are. Two and a half years gone in a flash, or so it seems, and the future is filled with botanical possibilities. Congratulations on your wonderful and hard-earned achievement! Thanks Janine, it's all gone so quickly though! Aww Thanks so much Fiona.